In the beginning of 1860s Dr. Joseph Bell Alexander (1821-1871) of Baltimore, Maryland, devised a rather interesting calculating machine, and on March 15, 1864, took out US Patent №41898 for it. 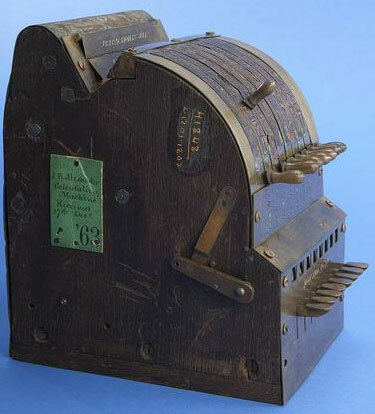 It seems the machine never went into production and only the Patent Office model survived to the present (kept in Smithsonian Institution), but it was used in other calculating devices, for example in the cash register of Melvin Lovell. It was a lever-set adding machine, made by copper, brass, paper and wood. Measurements: 20 cm x 14 cm x 19 cm. The construction is somewhat similar to that of earlier devices like Jabez Burns' Addometer and John Ballou's Calculator, but its mechanism is much better designed. 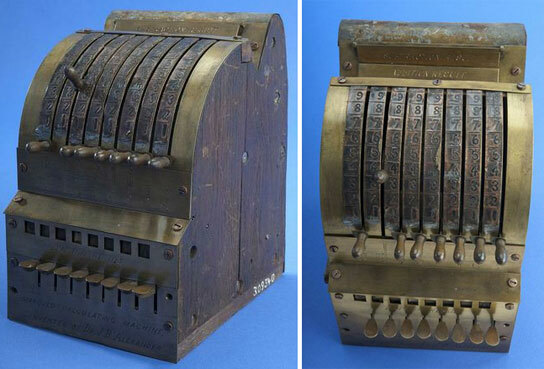 The device has a wooden case with a curved metal front and back, and somewhat resembles an early cash register. It contains eight sets of wheels and figured drums. The eight cogged wheels can be rotated vertically on a common crosswise shaft. Each wheel is linked to a lever that extends from the front of the machine and is rotated upward to enter a number. The digits from 1 to 9 are stamped on the front of the case next to the opening for each lever, to indicate the digit being entered. Each large cogged wheel is linked to two smaller wheels. Each one of the smaller wheels has the digits from 0 to 9 inscribed around the edge. The first turns forward, and gives the total entered (used in addition and multiplication). The second rotates in the opposite direction, and indicates differences (used in subtraction and division). Multiplication is carried out by repeated addition, while the division—by repeated subtraction. 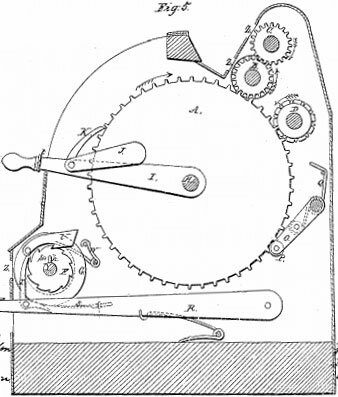 The tens-carry mechanism was implemented by means of a double pinion D and D' (see the nearby drawing), connected by the drum X. Every tenth tooth on a large wheel has a spring cog or tooth (marked with i), working on a pivot on the left-hand side of the main wheel A, that drives the adjacent wheel D, causing carrying (borrowing) to be done as needed at every ten carries. The results recorded by these wheels are visible through two rows of windows at the top of the case. Each of these windows has a hinged cover. A row of keys at the front of the machine is used in division and are connected to a mechanism, which is not connected to the main calculating mechanism. There is a crank on the left side (attached to the ratchet-wheel F) for zeroing the wheels associated with division keys. In the patent drawing is supposed to be a zeroing crank for the upper wheels also, but none is on the model. So, who was the inventor Joseph Bell Alexander? Little is known about this man. The physician Joseph Bell Alexander was born on May 11, 1821, in New Bern, North Carolina. By 1865 Joseph Alexander moved from Baltimore to Washington, D.C., and was co-owner (with Dr. Charles Brown) of the undertaking firm of Brown&Alexander, located at 323 D Street Washington D.C., which prepared Abraham Lincoln's body for his funeral tour. Joseph Alexander was married to Finnella Maury Little Alexander (1839-1904), a daughter of John Little (1805-1876), a rich landowner in Washington, D.C., and Margaret Foyles Little (1810-1872). Joseph Bell Alexander must hade been a very inventive person, because besides the above-mentioned patent for a calculating machine, he took out several other patents—6 patents for improvements of oil-burning lamps, a couple of patents for siphon bottle and bottle-stopper (actually it was the first American siphon bottle found in patent records), a patent for automatic railroad switch, etc. Joseph Bell Alexander died on July 12, 1871, in Washington, D.C., and was buried in Congressional Cemetery.